You can beat the LSAT; you just need to understand your mistakes. These books will teach you exactly why every answer is right or wrong, and how you can get them right. These are pdf versions you can use offline. Note: These are explanations for LSAT preptests. You have to buy the tests themselves separately. Could you explain why you chose LSAT 29-38 to be the focus of your explanations? My concern is whether the mastery of these rather distant tests would have a close bearing on my study. Since my time is limited, I want to put it into use efficiently. Also, what would be the approach that you recommend while using these explanations? I got to know you because I am also a student of 7Sage and a user of Cambridgelsat. The main takeaway I hope to get from here is to answer the questions fast and accurate under test-like situations. 7Sage does a great job of explaining and diagramming. However, my performance really sways under the pressure of time, especially when I have to speed up. Sure. It’s just a matter of history. A couple of years ago, LSAT Blog needed explanations for 29-38, and I wrote them. So those are the explanations I have. If I could wave a magic wand and change them into 52-61 explanations, I would. But instead I’ll need a few months to get those written. Basically I started at LSAT 69 and worked backwards. When test 70 is out, I’ll write explanations for that, then keep going backwards. LSATs 29-38 are still quite useful, and a lot of people use them, which is why people still buy my explanations for those tests. Obviously, newer tests are even more useful, but some people take 30+ tests or use older tests for practice sections. I wanted to compliment you on the great service you are providing so many students with your accessible breakdown of the LSAT prep tests. I am a December 2013 test taker, and before finding your site I struggled with finding breakdowns of each section of the prep tests that would help me. Your explanations are very clear and practical, and I wish there was some way to get all your explanations as I bundle I could read from. Your site and 7Sage have helped me better understand the logic games sections, though I definitely need more help with the grouping aspects of the games(having a strategy of how to group things per section.) It’s great that you began with prep test 69. I am trying to focus on the most recent tests(60-69) to get a better feel for what the one in December will be like. Your explanation of the reasoning section of 69 was excellent, and I hope you finish breaking down the remaining 9 because it would mean the world and it’s like I’m receiving a world-class LSAT prep education. Thank you so much! Thanks Jay! I’m working on LSAT 65 explanations right now, and should have more out soon. I’ll have more time to add to this site once the October rush is past. I’m really glad you like the explanations, I tried to keep them simple and straightforward. I think the concepts are not that difficult, so explanations don’t have to be. The difficulty of LSAT questions is that they do a very, very good job of making simple ideas complicated and misleading. Thanks for all the great stuff you’ve got to help us all out! Is there a PDF for the June 2007? Not yet. I’ll eventually make June 2007 explanations, but I want to write 52-61 first. Are the LSAT explanation PDFs exactly the same as the free LSAT explanations that you have on your website? Yes, the pdfs are the same as the free explanations. The main difference is that they’re in book format, so you can scroll through all the explanations at once + download them for offline use or on other devices. I’m always hesitant reading these comments or reviews because you never know who is writing them, but I have not been asked by to write a review I did this on my own and wanted to do it. These are the best I have seen and I have been looking all over the internet for LSAT question explanations. I’ve taken the powerscore course and have had a private tutor but I feel like I’ve made the biggest jumps using these explanations. These books are just like having a private tutor explain the answers to you but for a cheaper price, and you are able to go back and reread the explanations if they do not make sense. That is one problem I had with the private tutor is that they explained it but the explanation was not written down so I was not able to go back to reference it. The main courses are good because they give you the foundation you need to understand the kinds of questions on the LSAT, but these explanations really help you to fine tune your skills. And if you’re not trying to fine tune your skills to get the highest possible score you’re only cheating yourself. Get these books or read these explanations to make the big jumps you need to score high on this test. I wish he would hurry up and write explanations for test 52-61. I was just wondering, although it says “all explanations, “it does not include PT 75 right? It includes 75, I’ve updated it. I haven’t decided pricing once I write the new ones. Might be $99, or might be something like $129. But it’ll be a while before those are out. hi, I got a question. what is difference between the book ver. (PDF) and online free explanation? same? Same thing, except the PDFs can be downloaded offline, and also have the explanations in a scrollable format so you don’t have to click between pages. I think a lot of people use them if they’re studying without internet. I absolutely love your explanations and thank you so much for providing them for free. Is the explanation for PT 78 going to be available for free soon? Hi Lauren, Graeme is working on the explanations for the most recent tests. But, the date of release for the explanations is as yet unconfirmed. 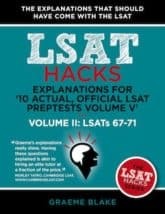 Just wondering if the explanations for PTs 29-38 sold on amazon with the title “Hacking the LSAT” are the same as those found on your website. Or does the older title mean an older version? Yes, those are indeed the same versions! 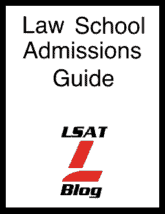 The only difference between the books and the online explanations is that the books have a small section on LSAT logic, and a section that allows you to search for questions on the tests by type. These resources have really helped me – thank you. Are you close to finalising the booklets for 39-61? Or are they somewhere I’m not finding? Graeme is currently prioritizing the most recent preptests, and new teaching materials. However, keep checking the site and mailing list for updates on the status of new explanations.